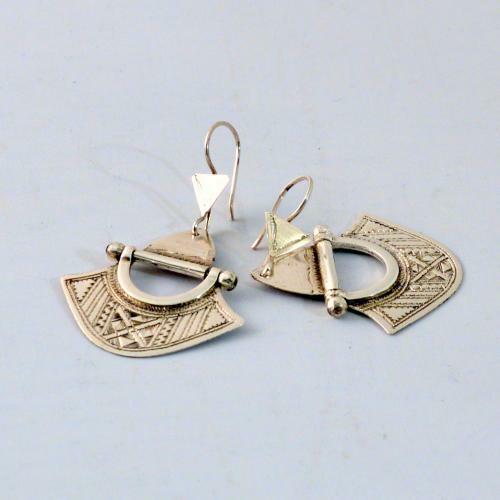 This model of earrings is called Khumesa, which means joy in the Tuareg language. These fancy earrings are full of symbolism: The lower part of the silver earring is framed by caravan tracks. Dunes scattered by the wind are depicted in the middle of the earrings. The triangular lines on the earrings are snake tracks. Snake tracks can also be seen on the outside of the earrings and there are more caravan tracks in the middle of the earrings. At the lower part of the ear studs traces of a centipede can be seen. This pattern can also be found in the upper part of the earrings. Under the hook of the earrings you can see desert sand scattered by the wind. The craftsmanship of silversmiths is handed down from generation to generation in Niger. The art of silversmithing is a form of storytelling. Many women and men can neither write nor read and so the stories, the symbolism and mysticism are passed on to the next generation via means such as handicrafts. We at Gundara are in direct contact with the silversmiths of the Ataher family in Agadez. We know the production and trade conditions and consider them fair. No money is lost to middlemen and the local silversmiths profit as much as possible from this trade.